What about presenting you the jacket of brown calfskin? 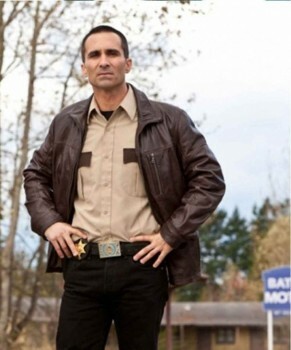 Which was worn by Nestor Carbonell as the Sheriff Romero in the TV series of Bates Motel? This Bates Motel Jacket that Nestor Carbonell drifted as Sheriff Picture provided for himself the styling portion in formal look. In this respect, this jacket has been made the same way and is accessible at the top rated value, so you can style in your own specific way. The “Sheriff Romero Jacket” is made of Cowhide calfskin leather and for comfortable and solid wear; Viscose lining has been made inside. For the gimmicks to be as same, the neckline is of shirt-style with complete front zip conclusion. One vertical zipped pocket on the left side upper midsection, two on the lower waist in zipped structure and two inside pockets.